To normal people's eyes (I mean, non-beauty-blogging folks), I don't think Zoya Lael would look much different from other vamps. Indoors it even looks similar to Revlon Vixen or Chanel Rouge Noir, which are more classic vamp colors that resemble "dried-up blood". However, under the studio lightings or the natural lighting, Lael finally reveals her nature. She is very grape-y as you see in the pictures. Although I love the color very much, I can't say the same thing about the formula since it is a bit streaky and thick. I am very fond of Zoya polishes in general, but unfortunately this particular one came with a wonky brush. Hence the not-so-great paint job here resulting those uneven lines. Nevertheless, I know that I will occasionally stretch my fingers out in the sun to admire Lael. Do you have a favorite vamp polish that is unique in your book? Beautiful colour! It must be the weather because I was also in the mood for purple last night -- and then I got distracted. Today I put on something else. :s I'll get back on track with purples eventually. I don't have too many Zoyas, hmmm. Yeah, as soon as the air cools down, I have this craving for purple makeup anything. I love Zoya colors. They are quite unique and beautiful! LOL ... I don't think so, it's the brush not you haha. I have to say that am not the biggest fan of their cream finishes but those with shimmer, yum yum. its soo gorgeous!! i WANTTT this color!! I love greys and blues as well. I really like purples but gotta be a little more careful since some purples can look garish and unflattering against my skin tone. LOL. I thought this reminds me of Korean grapes that are so rich in color, but it is now totally eggplant since you said it. Wonky lines or not this is already a way better paint job than I could ever do! It looks gorgeous on your skintone! To be fair, Zoya formula is rather good since it is big 5 free or something. I don't usually have problem with other colors, but Lael is a bit tricky. 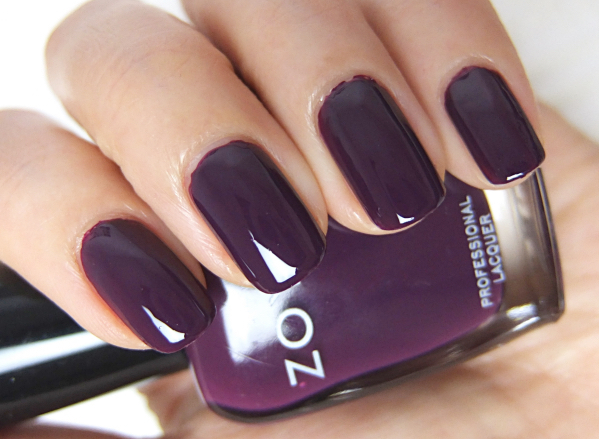 You look to set for fall with this gorgeous aubergine shade Lena! I find Zoya polishes to be a little hit or miss in general. I agree sometimes the application could be tricky depending on the colors or the finishes. What a gorgeous purple ! Perfect for the Fall ! Now that's a purple! I love it! Very fall. Ah, I love colors that are just so delightful, you always kind of sneakily look at your hands in the sunlight :) I'm glad I'm not the only one! I was just thinking that I wanted to paint my nails again today, but I can't decide what to put on.